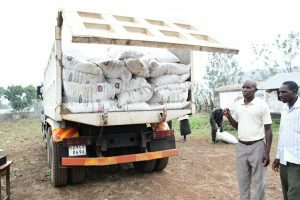 A lorry full of fertilizer distributed by the County Government of Nandi. Continuous cultivation of land without regular addition of nutrients has reduced soil fertility especially on farms belonging to small holder farmers who cannot afford fertilizers. 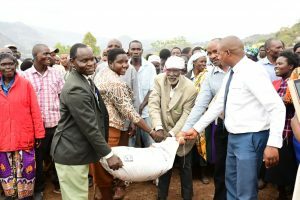 In a bid to enhance farm productivity for the small holder farmers who own one acre of land or less and do not have other requisite resources, the County Government of Nandi in collaboration with the National Accelerated Agricultural Input Access Programme (NAAIAP) on Tuesday distributed 750, 50KG bags of fertilizer to small holder maize farmers in Songhor/Soba ward, Tinderet Sub-County. 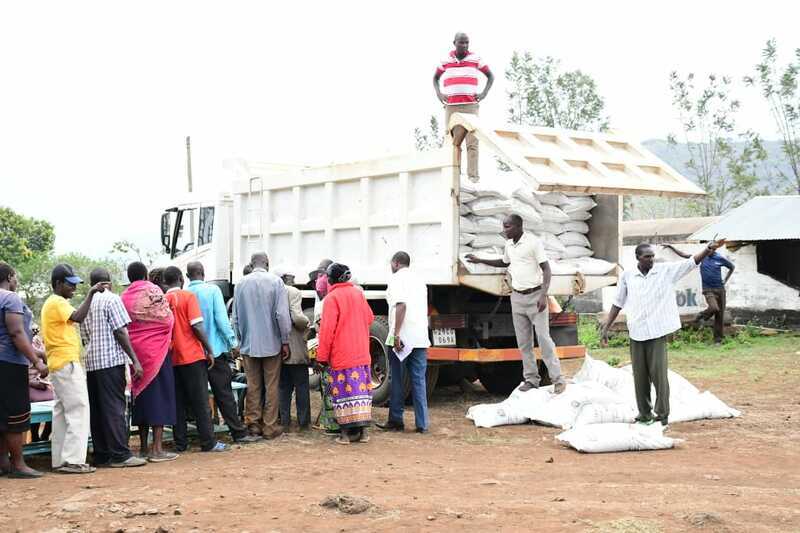 The vulnerable groups receiving fertilizers from County Government officials. 250 farmers drawn from 5 villages in Songhor/Soba ward received 3 bags of fertilizer each that included two 50KG bags for planting and one 50KG bag for top dressing. The NAAIAP program seeks to address the problem of low farm productivity by offering targeted subsidy in form of technical inputs to resource challenged farmers. The program’s global goal is to address the problem of low farm productivity arising from farmers not using the right fertilizer and certified seeds. While officiating the distribution, the CO Agriculture Mr. Wilson Lelei said the increase in yield and production by the farmers would meet the household food security and generate surpluses that can be traded leading to an increase in household income. Vulnerability preference and priority were given to Child & Women headed families, HIV/AIDS members of the society, PDWs, Youth and resource poor farmers. Present during the distribution excersice were the area MCA Hon. Justine Chepnyango, CO Agriculture Mr Wilson Lelei, NAAIAP program coordinator Pr. Oduori among, SCAO, Chief among other government officials.